Have we abandoned the uniquely American concept of the political, legal and educational recognition of unalienable rights? If so, is there a political movement to restore the core purpose and principle of the American Declaration of Independence? As documented in Understanding Unalienable Rights, the dictionary meaning of unalienable rights has been corrupted. School children are no longer instructed about this most basic element of the Declaration of Independence. Leading liberty minded legal and “think tank” organizations often fronting the freedom movement, treat or label the seeking of unalienable rights protections as outdated. They argue a system of “civil rights”  as the appropriate man-made replacement. 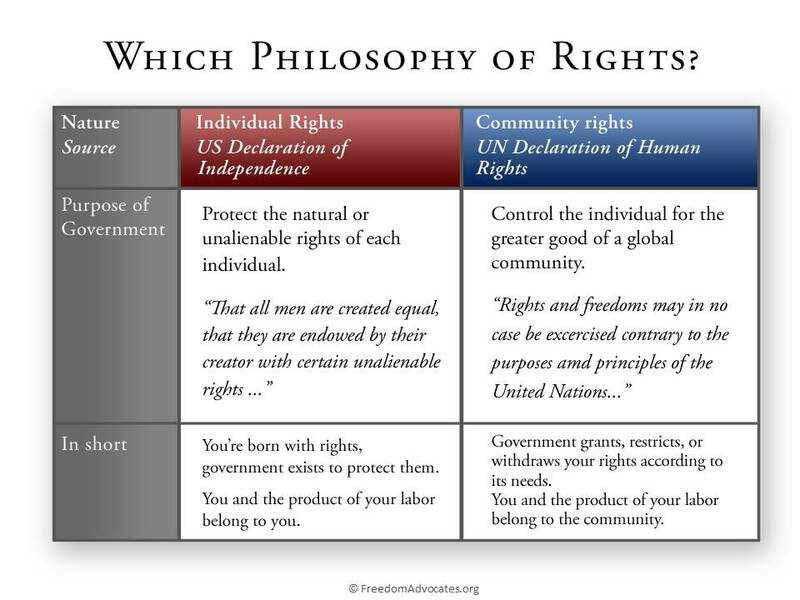 Think tanks of most stripes quietly argue that the idea of unalienable rights is flawed and indefensible. Correspondingly, the idea has been largely abandoned by academia and intellectuals. The question then becomes: Can the American experiment in freedom continue without a foundation predicated on the notion that each person possesses a life that is their own? I conclude that without the political recognition of unalienable rights it cannot be assured that the political system will recognize that your life belongs to you. This is not a moot issue. At the root of the globalist movement is Agenda 21 Sustainable Development. This worldwide program agreed upon by 178 nations, including the United States, reveals the directive that human population is to be decreased by 85% (United Nations; Global Biodiversity Assessment Report, page 773). This policy has appealed to many who argue “overpopulation.” Accordingly, says the consensus, everyone’s “right to life” must be discarded in order to achieve globalist objectives. Further investigation of contemporary political philosophy demonstrates how our government has abandoned the notion of individual liberty. The freedom to speak has become subject to an increasing array of laws and politically correct mores. Travel is becoming monitored and increasingly restricted as the rules and infrastructure of Agenda 21’s land use element take effect. The intended consequence is to limit our mobility and use of resources. These are primary objectives in implementing Agenda 21. The global warming hysteria is being used to force people into “human settlements,” in order to contain and control human action. The man-made global warming fraud serves the implementation of Agenda 21 and the destruction of liberty. What has been lost is the understanding that private property is not simply the ownership of something. Private property is the relationship between a person and a thing. It is a person’s use and enjoyment of something that reflects the essence of the ideal of private property. Your continuing use of what you think is yours, is now, for everyone, un-assured and unprotected. Private property is being abolished. A system of private property rests on the economic system of free enterprise. Free enterprise means that the citizens own the means of production. This is not to be confused with the general definition of capitalism. The term “capitalism” was coined by Karl Marx to describe mid-nineteenth century European political-economics which then, as now, is dominated by a fiat money system. Webster’s unabridged 1988 dictionary describes capitalism as, “The economic system… originally under fully competitive conditions… and its later phase by the growth of great corporations, increased governmental control, etc.” This transformative conversion was made possible through the public-private partnership system of fiat money which was adopted in the U.S. in 1913. When freedom warriors defend the system of modern capitalism they often undermine the principals of free enterprise, secured by the ideal of private property. This happens as the “defenders” often play into globalist hands by virtue of furthering public-private partnership economics. Public-private partnership is the “new economy” brandished by the agents of modern globalism under Agenda 21. The succeeding effort to abolish private property is the primary cause for the continuing collapse of freedom in America. George Washington warned; “Private property and freedom are inseparable.” As freedom fades, along with American sovereignty, the notion of unalienable rights will become erased from American consciousness. We cannot let this happen! Public-private partnerships and Sustainable Development are in your community. This is why the study of Agenda 21 Sustainable Development is vital for our posterity, if we and they, are to enjoy a life of one’s own. Today, without public awareness of Agenda 21, the prospects for free enterprise and for freedom look bleak. Public-private partnerships (formerly known as economic fascism) must be exposed and disbanded before unalienable rights can again become recognized by the American government, maintained by our courts, and taught in schools. Where the right to the use of property is secured. Reaffirming unalienable rights is our call to duty. You can contribute to this accomplishment most effectively by defending unalienable rights and by understanding and informing others of our government’s relentless commitment to the ‘global to local’ program of Agenda 21 Sustainable Development. Civil Rights demand Social Justice: applying the law to members of groups to advance a centralized interpretation of “common good”.